Expires in 1wk . Last validated 1mo ago . Used 6 times. Reinaldo Rafael Briceño Villa I am validating that this deal works as described, use the promo code at checkout to claim your 40% off. 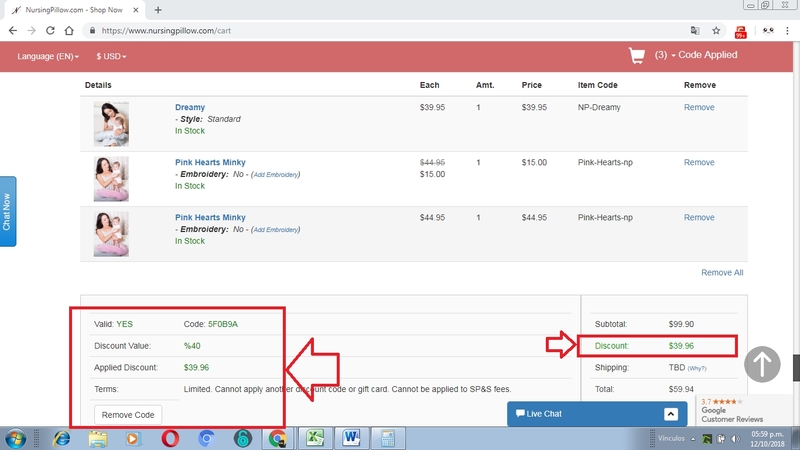 jesus navas This promo code is working as described, Get 40% Off Everything at Nursing Pillow (Site-wide) by copying and pasting the promo code 5F0B9A at checkout in your shopping bag. jesus navas Get 40% Off Everything at Nursing Pillow (Site-wide). Use the coupon code 5F0B9A to claim your discount.Some Exclusions may apply to this offer. German This deal works as described. Go to the web site, add your item to cart, proceed to checkout, enter promo code <5F0B9A> and get 40% off everything at Nursing Pillow. CRUZ GONZALEZ I am re-activating this expired deal. Simply enter the code <5F0B9A> in the promo code box when checking out to receive 40% Off Everything at Nursing Pillow (Site-wide). This is a limited time offer. Natali Lugo This promo code works as described. Go to the page, add the items you want to buy in the shopping cart, apply the code to get 40% off in your next order and proceed to checkout. 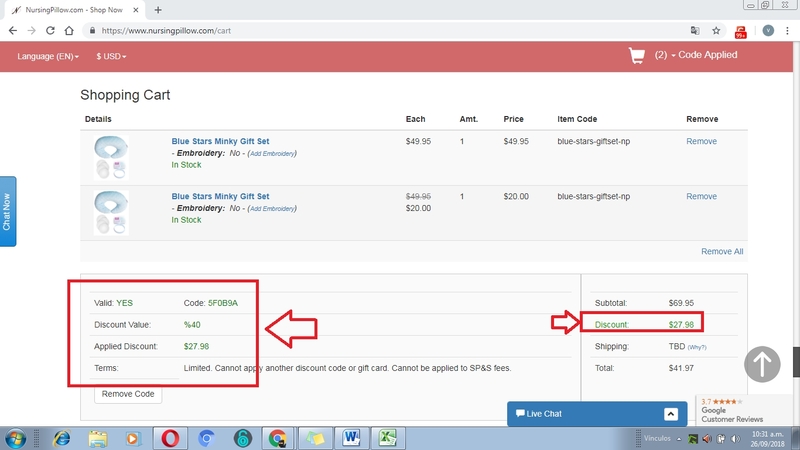 Victor Arriojas This coupon is re-active and works as described, you simply have to enter this code in the box to apply the discount. Some exclusions may apply to this deal. eddiluz Offer valid for online orders only; not valid in-store. 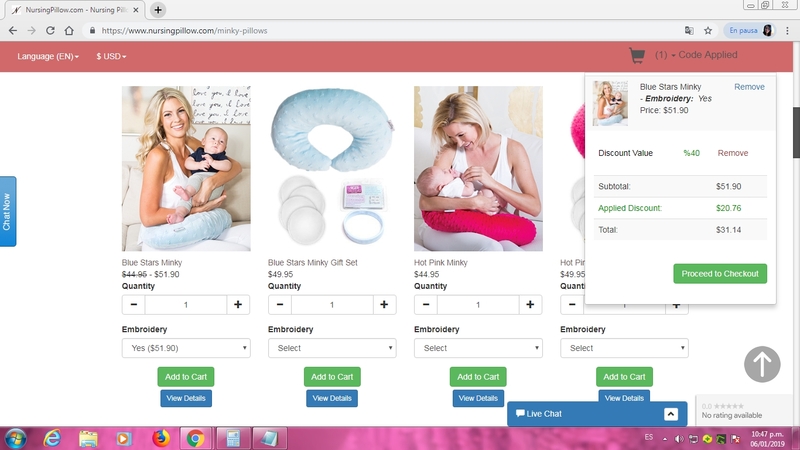 Add to the shopping cart the eligible items you want to purchase at Nursing Pillow (Site-wide) , proceed to checkout, redeem the promo code 5F0B9A on the promo code box and your order will receive 40% Off Everything.